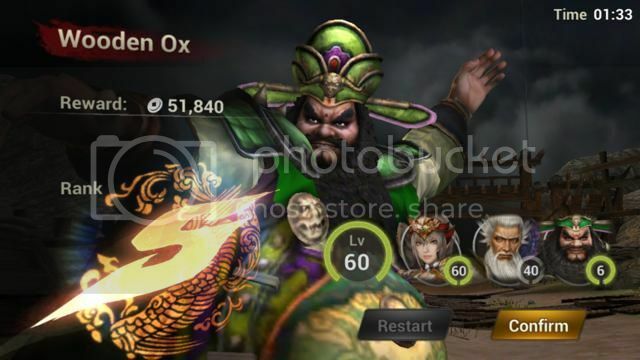 Last edited by letsgososhi; 25-04-2017 at 06:57 PM..
1) Use Huang Zhong at start to kill small ox. 2) Once big ox coming out, swap dong zuo auto hit big ox. Somehow, he can mini stun which slow down the ox. Start watching your screen raining coins ^^. 3) Swap back huang zhong once big ox passed to continue kill small ox until time up. I believe the key is dong zuo lvl & atk damage as even after big ox passed, i can't kill him yet. Need slowly raise the damage output of my dong zuo. No video demo. It's quite ez lah, bit practice nia. Btw, make sure ur dong zuo wear equipments without + crit. My lvl 6 two star dong zuo atk about 300, power around 5k. I managed to get 30k coins with Wang Yuan Ji, Currently farming and make a 3 * dong zhuo.. I think the 50k coins can follow this video..
Last edited by letsgososhi; 26-04-2017 at 12:10 AM..
Nice.. thanks for sharing. My 3 star dong Zhuo is level 1. Should I level him up? do you guys keep rerolling to get good characters or just play? Level 1 enough liao for 3 star. The idea is for him to not hit 10 dmg and still can do low dmg + slow down the ox lorry. My highest also 53k silver. Works even better if you got Lu lingqi 6* leader buff, it gives dong zhuo more attack spd.